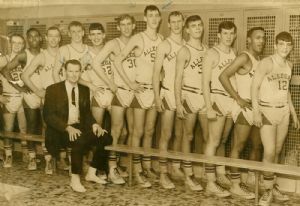 Allegany Basketball Team, circa 1966. Keys graduated in 1967, and Powell in 1966. Pete Keys was born in 1949 and passed away in 1976. Keys, along with his brother Rodney and Elaine Frisby, were among the first African-American children to integrate Cumberland's Columbia Street Elementary School in September 1955.